Wowsers it’s been windy recently! 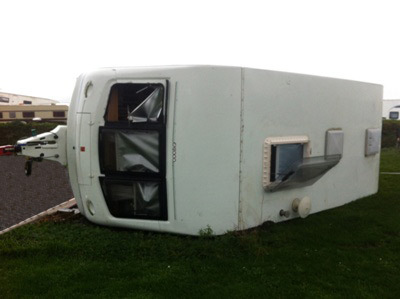 We’ve received a record amount of caravan insurance claims for wind related damage over the last few weeks, with typical claims including skylights being ripped off, branches banging into caravans and even caravans tipping over. In many cases there’s little that could have been done to prevent such damage but we do have some tips to minimise the risk of accidents and damage when winds turn gale force. If your caravan is in storage and high winds have been predicated then it’s sensible to, wherever possible, minimise the risk of it being damaged, either by being blown over or by objects near to it being blown in to the caravan. If your caravan is stored at home on a driveway then, if possible, consider the direction of the wind and whether its current location provides any protection, particularly wind which is hitting the caravan side on. If the caravan looks likely to be hit by wind side on then you may want to consider moving it to a more sheltered location temporarily, or rotating the van so that wind is hitting it head on. If your caravan is stored on a secure storage site away from home then it’s a good idea to speak to the site operator and find out if they are taking steps to minimise the risk. 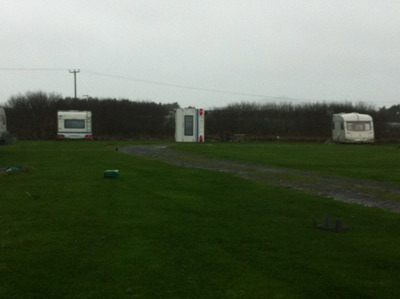 As well as this you may want to move your caravan in to a more sheltered location (asking permission first). Whether storing your caravan at home or on a storage site one thing you can do is to weigh down the caravan to minimise the risk of it being blown over. This can be done most simply by placing heavy objects such as awnings or filled water carriers into the centre of the floor of the caravan. As an extreme measure you may also want to consider anchoring the caravan to the ground using strong straps (such as storm straps for awnings) and heavy duty screw-in ground pegs, though make sure the van is very well protected using foam and material to create a barrier between the strap and the bodywork of the van. Otherwise the friction caused during movement in high winds could cause serious damage. As well as getting the caravan itself into a sheltered position when at home it’s important that any objects or structures which are susceptible to strong wind, such as wooden fencing, greenhouses, or garden furniture are either firmly secured or if appropriate moved to a less exposed location away from the caravan. When choosing your storage location, you may want to consider overhanging or nearby tree branches that could blow, swing into, or fall off onto your caravan, and then prune or cut back accordingly. Caravan campsites tend to be in rural, countryside or seaside locations, which can often mean they are even more open to nature’s elements than more urban locations. If very high, or even gale force winds are forecast whilst you are on a campsite then it is extremely important that you take the necessary steps to protect firstly your own safety, and secondly your caravan. If extreme weather conditions have been forecast then your first consideration should be whether it is safe to stay in the caravan or not. It may be wise to tow the caravan to a less exposed location (before the high winds hit) or to leave the caravan weighted down and secure, but spend the night in a hotel nearby. If you do choose to stay on the campsite then if possible take some of the steps outlined previously such as positioning the caravan so that the front is facing on coming wind, placing heavy items on the floor of the caravan to weight it down, and considering using storm straps to pin the caravan and awning down (make sure to properly protect the bodywork from the straps rubbing). Awnings are even more susceptible to high winds than caravans due to their shape and light weight canvas construction. Even if medium strength winds are forecast it may be a good idea to take your awning down to avoid damage as an awning can cause massive amounts of damage to your caravan should it become loose, or even detach completely and hit other caravans, cars or structures. If winds are moderate you could consider an awning storm strap which hooks over the awning and is pegged in at either side to pin the awning down. If high winds are forecast then use your full awning bag as a weight to give your caravan extra stability by placing it in the centre of the caravan’s floor. Touring caravans are relatively light, with high sides and a large surface area, in other words, they are hugely susceptible to the push of strong winds, particularly those which hit the caravan side on. It’s for this reason that you should avoid towing your caravan in high winds unless absolutely necessary, and if you do have to tow that you take extra care along the way. The speed at which you tow your caravan will obviously not affect the speed of a gust of wind which hits you directly side on, but if the wind is hitting your van at an angle then driving quickly will effectively increase the wind speed on your van. Even more importantly, and no matter which direction the wind is blowing from, driving quickly will make it much more difficult to control wobbles from the ‘van should it be hit by a strong gust of wind. A wobble that turns into a snake (where the caravan swerves from side to side behind the towing vehicle) is much more difficult to control at higher speeds and as such you should always drive as slowly as reasonably possible on the road you are travelling, even if it means pulling over every now and again to let other motorists past – an accident will slow everybody down much longer. Having a quality stabiliser fitted will help, but an even more effective way of avoiding snaking is to have your caravan fitted with an electronic anti-snaking device such as the excellent AL-KO ATC (Automatic Trailer Control) or BPW iDC. Many new caravans have these fitted as standard and many older caravans can have such devices retrofitted. Don’t forget that by having an electronic anti snaking device fitted you will also qualify for a caravan insurance discount with Caravan Guard. Motorways are best avoided in very windy conditions when towing your caravan for a number of reasons, not least because vehicles will be travelling much more quickly and it will be more difficult to drive slowly. Also, because motorways are built to link large cities they tend to cut a straight line through open land or farmland, meaning they are much more exposed to high winds than more minor roads which will twist and turn to link smaller towns and villages. Motorways are also often built slightly raised to allow them to seamlessly pass over rivers, streams and bumps in the land, meaning they can be even more open to the elements than a normal ground level road. The final reason that motorways are dangerous for caravanners when towing in gale force conditions is that the sudden change in wind speed, often caused by lorries or other large vehicles overtaking, can cause your caravan to wobble even more than a constant stream of strong wind would. It’s this buffeting of the wind which causes real problems. Also avoid roads which you know to be very exposed, such as those near the coast or on high ground. 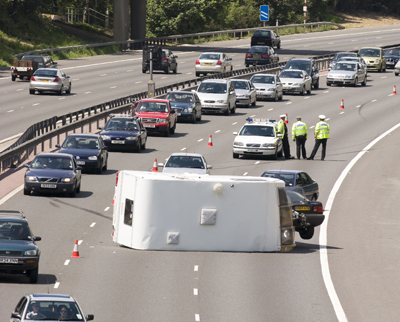 It sounds obvious, but the best way to avoid your caravan tipping over when towing in high winds is to avoid driving in the first place. Putting aside the damage to your caravan and car in the event of an accident, the danger to you and your passengers’ safety is just not worth the risk. So unless you are travelling back home from a trip, and driving is your only option, it is a good idea to postpone towing until the high winds have died down. Oh Fantastic information you had given through this blog, I am very impressed with your blog. Thanks for sharing such a interesting blog. I am glad you said to take your awning down from your caravan in the case of high winds. We recently got an awning for our new caravan. 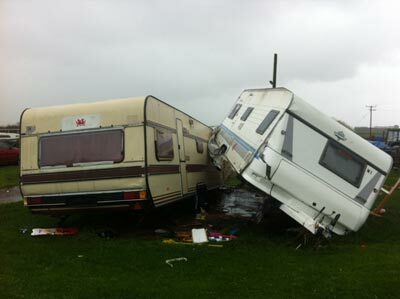 Thanks for the tips on how to avoid damage to your caravan during high winds. added comment re. anchor at each corner steady….they did not fasten around leg but through the actual chassis near the leg ,sorry for mis-understanding!! I worked in the Caravan industry for 30 years, and have reservations about the latest advice to chain corner steadies on a tourer. A lot of modern day tourers corner steadies are only bolted through the floor and are not part of the chassis. In very high winds the chained down jack could pull the bolts through the floor. Thanks Dave – that’s a very good point. All advice is most welcome, and should be mostly heeded to, however the best ally to the motor home / caravaner owner is purly COMMON SENSE. If you are unsure, then step back and think! It is worth missing a day or two of your holiday, or risking injury ( or worse ) and damage to your unit. Very good point Michael. If a caravanner thinks he is putting himself and his family at risk, then it’s worth delaying the trip until conditions improve. Having experienced some very strong winds on a camp-site on the Pembrokeshire coast, I would also suggest that, in addition to facing into the wind, it is a good idea to position the tow vehicle close in front of the caravan, as close to the towing position as possible. This simulates the sort of condition that is experienced when towing, breaking the force of the wind and deflecting it over the top of the caravan. I have been in Wales when the wind got up and was hammering the van and awning. I couldnt get the awning down so opened all the doors and let the wind blow through it. This worked very well an no damage caused. All fantastic advice, which we had to use on Outer Hebrides in 2010. Site owner kept telling us wind directions to turn to. Also had to remove big Isabella awning in Lakes when Hurricane arrived in September 2011. I have a Lunar Clubman with ATC, and a Disco 4, but my unaccountable snaking stopped when we had A2, tyres supplied on request with new car were removed. We are still to hear if they were faulty. Well Done Caravan Guard. Some very useful tips. looking forward to Excel Caravan & Camping show at Excel in afew weeks time. Great to get your feedback. David – the tip about using your car to break up the worst of oncoming winds is a really good one so thanks for that, we’ll definitely use (steal) that when giving advice in the future! Captain! – Top tips, and as we mention in the post positioning your caravan so that winds are hitting head on is a great way to reduce the risk of it being blown over. Michael – The AL-KO ATC is an excellent device that makes a massive difference to the stability of your caravan during towing. Plus, don’t forget you get a 5% insurance discount with Caravan Guard for having one fitted, so once it has been installed be sure to give us a call and we’ll make a note ready for your renewal. Or if you aren’t currently with us then mention it when you get a quote. Excellent information from you, and good feedback comments too.I for one am so pleased I have booked my new c/van in to have Al-Ko ATC fitted. Hopefully the wife will relax more whilst we are towing. Good advice, consideration to the position on the site if possible, don’t forget trees blow over. Also position your car so it breaks the wind before it hits the caravan(do not hitch up,you may damage both) if possible. Keith is spot on in what he says above, and our advice is always to avoid using your caravan in high winds. The guidelines in this article are for the situations where being exposed to high winds are unavoidable, and are no substitute for avoiding the wind altogether! weather forcasters will warn you of predicted high winds, so why not plan you journey a day later or earlier, even if it means leaving a site. the sight of a caravan broken in pieces is very distressing for all, and is also a negative advert for the pastime we love. Consider the type of ground on which your caravan is sitting. Our caravan was in a meadow where the earth had been softened by rain and the grass allowed to grow longer than usual. When it blew over in 1989 it suffered no material damage. We pulled it back on its feet using two cars and after refixing an internal door it was ready to go again! I found the article very interesting to read and the advice good.